Did anybody add “Eat more vegetables” to the list of things they want to accomplish this year? 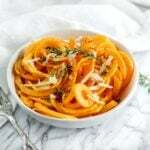 I hope so, because these butternut squash noodles will make you want to eat lots of them!
! You can use spiralized vegetables in place of pasta with your favorite sauce, and I promise you won’t miss the pasta. Especially because you don’t have to wash an extra pot and a colander (yay!). 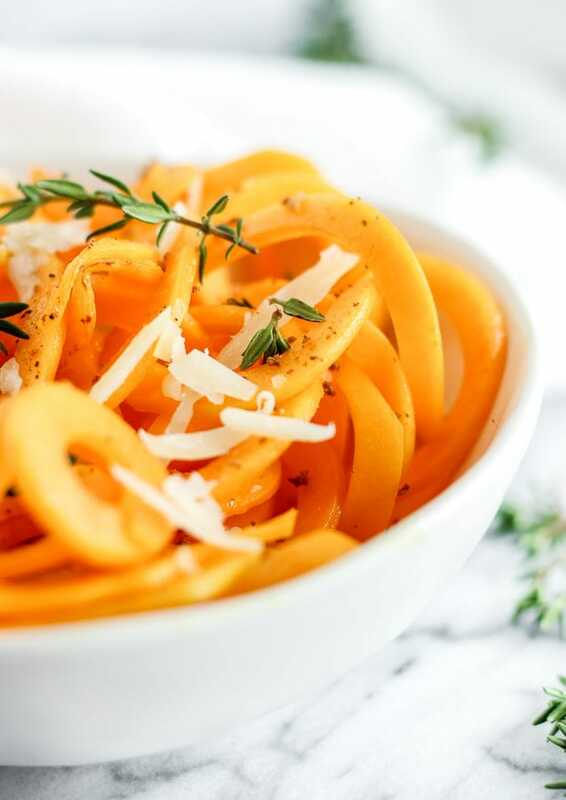 This easy butternut squash noodles recipe is one of the quickest and easiest recipes. By the way, what do you call butternut squash noodles? Buddles? Squoodles? I like squoodles. How do you make butternut squash noodles? 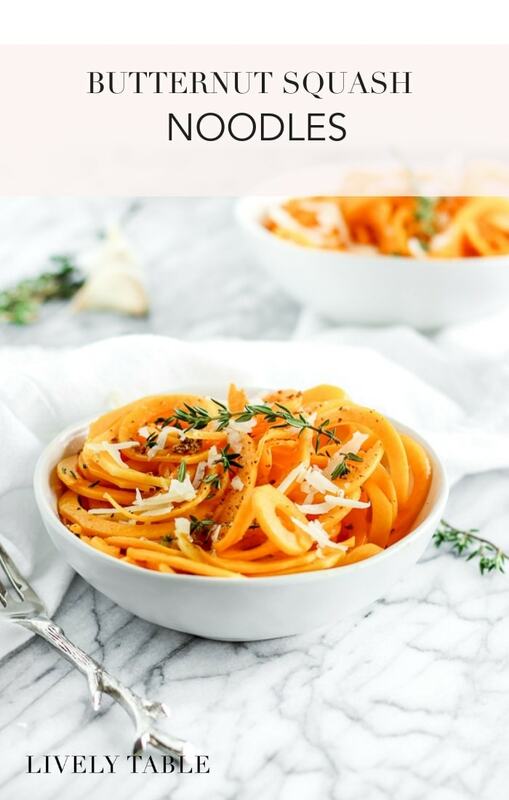 Butternut squash noodles are so easy to make! First peel it, then use a sharp knife to cut the butternut squash in half. Scoop out the seeds, and then spiralize the squash with a spiralizer. How do you serve butternut squash noodles? Butternut squash already has so much flavor that you hardly need a sauce! I made a quick and easy one right in the pan with the butternut squash noodles out of garlic, olive oil, thyme, and vegetable stock. Then I threw some toasted bread crumbs over the top and done! Dinner is served. So easy. You can also use any pasta sauce you’d like and add lots of toppings, if you want to! Yes! Butternut squash is loaded with beta carotene, a precursor to vitamin A which could help you fight off breast cancer and macular degeneration, as well as boost your immune system. It’s also got lots of heart healthy fiber and almost a half a day’s worth of vitamin C in 1 cup! 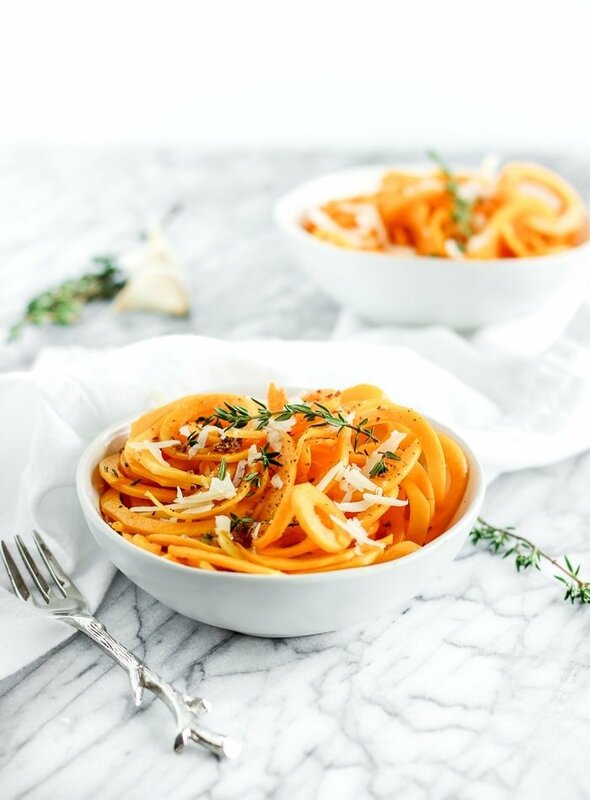 If you’re missing your zoodles this winter, or you just want to include more veggies in your diet, try out these butternut squash noodles (Squoodles! So fun to say!). Maybe you’ll find your new favorite dinner! 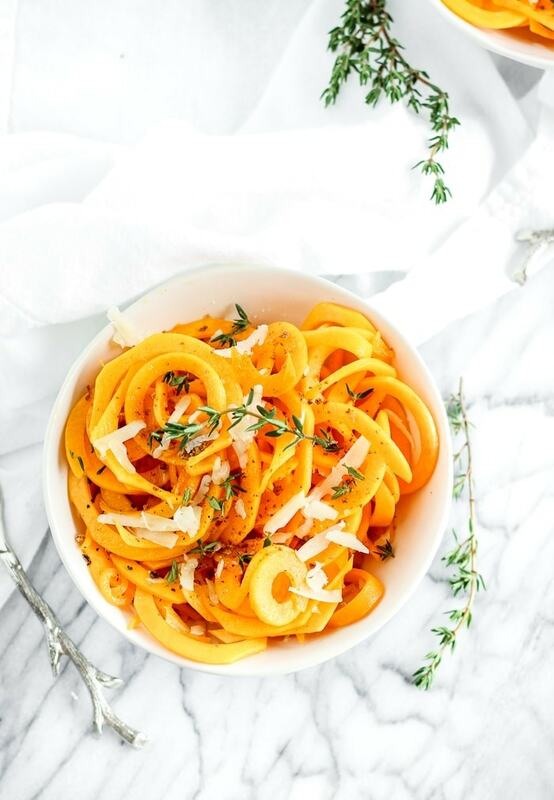 Make “noodles” out of butternut squash using a spiralizer. Alternately, you can julienne the squash. Heat a medium non-stick skillet over medium heat. Add panko and lightly toast until golden. Remove panko and set aside. Coat bottom of the same skillet lightly with olive oil. Add squash noodles and minced garlic to hot pan and sauté while stirring until slightly soft, about 3 minutes. Add thyme leaves and stock as desired. I like mine to be more saucy so I add a full 1/4 cup. Continue to cook until the noodles are “al dente.” Remove from heat and top with panko and parmesan (if using). Serve hot. *for vegan, omit cheese and use vegetable stock.